Bring on the action with the Ultimate Spider-Man Comic Peel and Stick Wall Decals! Transform a space with officially licensed Marvel wall art. Designed with a palette of rich reds and blues, classic comic scenes are refreshed in this thrilling pack. 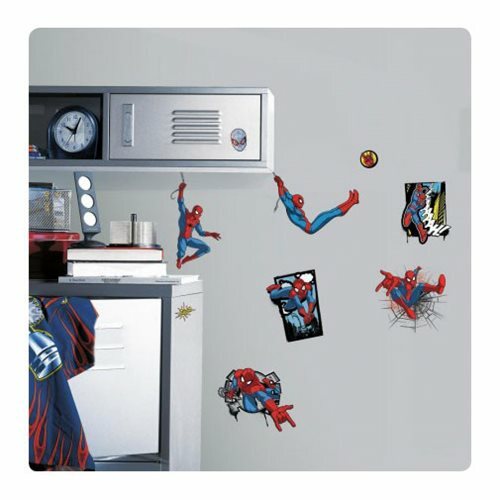 Featuring 17 wall stickers on easy to apply vinyl, peel and stick action-packed poses of Ultimate Spider-Man to any smooth, flat surface. Assemble in seconds; peel and stick directly on the wall or smooth, flat surface. Remove and reposition as needed. Decals arrange in sizes from roughly 1 3/4-inches wide x 1 3/4-inches tall to 7 3/4-inches wide x 8 1/4-inches tall.